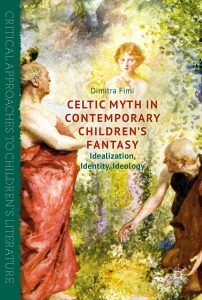 This week, the e-book version of my new monograph, Celtic Myth in Contemporary Children’s Fantasy, was released. This is my first experience of the braver new world of simultaneous e-book and hardback publication. The hardback won’t be out there for another couple of weeks, but the book is now, for all intents and purposes, published. Hooray! I’ve blogged before about the cover of the new book (with which I am very pleased indeed), and I have also shared some of my research on Lloyd Alexander (here and here) and Henry Neff (here and here). You can download the front matter of the book via this link, and get access to particular chapters (or indeed purchase the entire e-book) here. This book is part of Palgrave Macmillan’s Critical Approaches to Children’s Literature series, and when a monograph is part of a series it has an additional layer of “house style” to adhere to. This means that my Table of Contents is a little less detailed than I originally intended. I tend to work better with chapter titles which are then subdivided into smaller sections with their own subtitles. In my first monograph on Tolkien, all chapter titles and subtitles appeared in the Table of Contents, but with this one I had to stick to the rules and include chapter titles only. For those of you, though, who may want to know a bit more about the contents of each chapter and would like to see the subtitles for each chapter section, I am offering below an “extended” table of contents with page numbers – I hope it will prove useful to readers.